Every dream is worth pursuing. In fact, no one should ever give up on their dream, especially if it carried a genuine cause. Many immigrants leave their homeland in search of a better place to call home. Some find it in the United States, where they also discover their own American dream. In many cases, a hardworking person would always get a chance to fulfill their hopes of a bright future in the land of opportunities. But what will happen if that person abuses that chance and takes is for granted? The answer is certain – that person will be treated as a criminal. “The Polka King” is based on a true story. It follows the local Pennsylvania polka legend Jan Lewan (Jack Black), whose great development plan brings him lots of money through the investments of elderly people. Those people believe they will get their money back. As the money continues flooding into Jan’s pocket, he gets amazingly rich, becomes famous, appears in shows, and even manages to meet the Pope. The list of his achievement is quite long, however, all that success does not save him from getting into jail for running a Ponzi scheme. The film offers a colorful and an enjoyable portrayal of the Polish-American immigrant, who fights hard to make his way up, even though that road lies through schemes and lies. Jan’s story does not start in a negative way. We first meet Jan Lewan singing, dancing and in a happy marriage with his beautiful wife Maria. Jan appears to be a big dreamer, but his belief in makings things happen carries him away. The idea to create a show strikes him immediately, as he begins accepting one generous contribution after another, as well as investments from elderly couples having no intention to return it to them. Yet, this does not work as he has planned. Maria faces her own struggles. She keeps on defending her right to be with the man of whom her always cheerful and youthful mother (Jacki Weaver) has never approved. As the story unfolds, the viewer gets the chance to see what a hopelessly terrible businessman Jan Lewan is. Believe it or not, will still admire him for his unsuccessful attempts to become someone who fails to learn the system inside out. Eventually, that will bring him to the point when the authorities will knock at his door. And not at all for a good occasion. “The Polka King” written and directed by Maya Forbes and Wallace Wolodarsky, is a great illustration of a man with incredibly bright ideas, who cannot fulfill them. Not completely, at least. But even then you will never dislike him. Jack Black’s likable and funny portrayal of Jan brings a humoristic side to the story of the man who – intentionally or not – turned from a Grammy nominee into a manipulative person with greedy intentions. 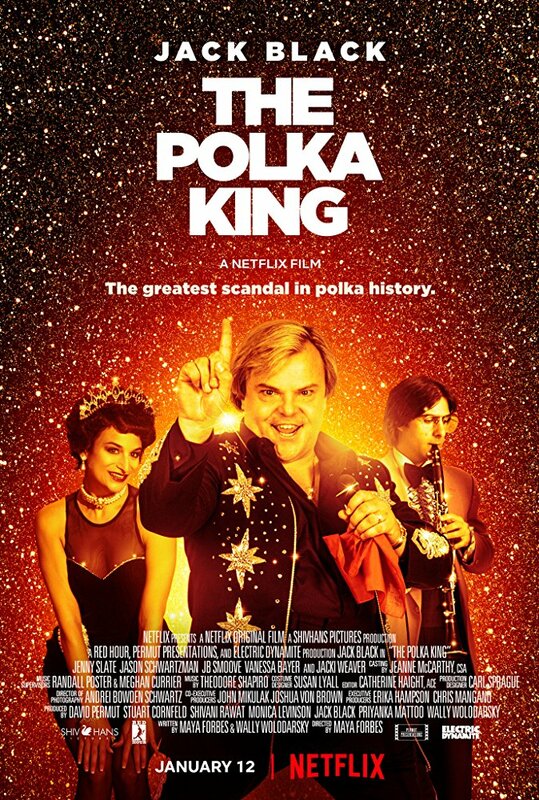 In conclusion, there is nothing superb or fascinating about “The Polka King” and seems that has never been the aim of its creators. It is a solid piece with decent performances from Jack Black, Jacki Weaver, Jenny Slate and Jason Schwartzman. It is a delightful comedy about one man’s journey. The beautiful songs make Forbes’ and Woladarsky’s work shine, leaving the viewers happy and pleased with the final result. Finally, films like “The Polka King” deserve attention; and the story of Jan Lewan is surely worth being told, and I can see no reason why not?